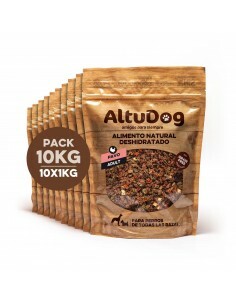 Full and natural food for all breeds of adult dogs with a normal degree of activity. GLUTEN FREE - GRAIN FREE - NO preservatives nor colourings. 10 sachets of 1Kg which corresponds to the nutritional value of 40kg of fresh food. Once open, keep in refrigerator. The product will maintain its properties for 25 days. 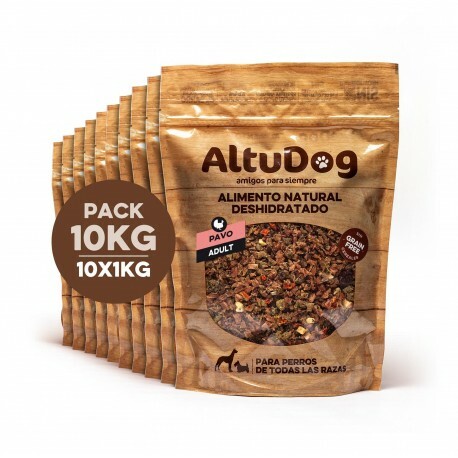 Ingredients: Dehydrated turkey breast 70%, dehydrated fruits and vegetables 10% (carrot, tomato, spinach, apple and cranberry), Wagyu fat 8%, Wagyu heart 5%, whole egg with shell 2%, salmon oil, seaweed, garlic powder, turmeric and rosemary extract.